This installment of the Ultimate Relationship-series clocks in at 8 pages – 1 page front cover, 1 page editorial, 1 page how to use, 1 page SRD leaving us with 4 pages of content, so let’s take a look! Okay, in supposedly a formatting glitch, we start this file with a double header: “The rabbit Prince” is oddly printed sans context above the proper headline, “The Viking Maiden.” Stat-wise, the lady would be an unchained barbarian with the superstitious rage power – it should come as no surprise, then, that her affinity is with martial characters and honorable fighters; her negative affinity particularly pronounced regarding witches, particularly those of Irrisen. The viking maiden, once encountered, is the sole survivor of a botched raid on a dungeon that saw all her allies killed and herself trapped – hence, upon freeing her, the immediate reaction to her is pretty important – pity does not work well within her cultural paradigm. Advancement-wise, she focuses on two-weapon fighting with her shield. Physical relationships are rather easy to have with the lady, but to get to her heart, PCs will need to work. The rank-ups of the viking maiden are centered around understanding viking culture (or rather, somewhat stereotypical tropes pertaining it) and range from Perform (oratory) to knowledge (local) and also sport several combative tasks – from a nonlethal duel to arm wrestling and competitive drinking, one has to prove prowess and a willingness to learn about her culture to find the humanity behind her brash and competitive behavior, the doubts and anxieties that are there. If she is not taken to rank 4 before fulfilling her temporary oath to accompany characters to her homeland, she leaves. Boon-wise, rank 7 unlocks Intimidate or Profession (sailor) as class skills and grants +1 to CMD versus disarm and sunder, while rank 10 provides shared trait bonuses and an AC-bonus when adjacent to the shield maiden…and potentially, when the character’s using a shield himself, a two-person Shield Wall teamwork feat benefit. Editing and formatting are good, though e.g. when separating lines are used is a bit inconsistent – still nothing grievous to complain about. Layout adheres to a nice two-column full-color standard and the pdf has no bookmarks, but needs none at this length. The pdf has no artwork. Mark Seifter’s Shield Maiden is pretty much the tough warrior containing a wound from the past that she only shows to her most trusted allies. 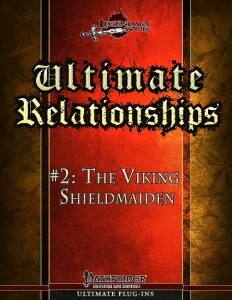 The general progression is interesting, the romance iconic enough in its progression, but I do feel the whole viking component and her nature as a shield maiden would have provided a great way to make her more detailed, more unique – as written, her overall romantic progression failed to take the cultural tidbits and gender roles into account, which could have been used to flesh her out in much more detail. That being said, this is not a bad romance and her arc is solid. Hence, my final verdict will clock in at 4 stars. You can get this romantic interest here on OBS and here on d20pfsrd.com’s shop!